Here's an idea to solve the bird-incinerating inconvenience of the Ivanpah solar/fossil-fuel power plant, but still generate unlimited free green energy 24/7/365, and cool down Gaia too! Green activists & everyone else are a little upset by the new solar/fossil-fuel plant igniting birds in mid-air, possibly because the birds are attracted to the reflections which look like a body of water. Un-Natural selection has not yet weeded-out the dumb birds that can't distinguish a solar power plant from a body of water. Solution: point the mirrors away from the Sun at the clear sky and use them instead to highly concentrate the 340.3 Watts per meter squared continuous longwave infrared "back-radiation" from man-made greenhouse gases. Unlike solar power, backradiation is available 24/7/365 and on cloudy days or nights - there's reportedly even more greenhouse gas backradiation available on cloudy days and nights than with clear skies, and no need for fossil-fuel backup at night or on cloudy days! Plus, with the 173,500 mirrors directed away from the Sun and at the clear sky, solar energy will be reflected back to space to increase albedo and cool Gaia much more so than use of this solar/fossil-fuel plant to reduce harmless CO2 emissions. The safe but highly-concentrated longwave infrared backradiation on the power towers will be totally harmless to the silly birds that are still attracted to the mirrors, completely eliminating all those "streamers." These Stefan-Boltzmann Law calculations clearly prove that concentrating the greenhouse gas IR backradiation from the clear sky will produce 3 times as much free green energy as from the SUN, and 24/7/365 too! Using this bright idea, they can hit two birds with one stone, oh, sorry, bad analogy. But seriously, what are they waiting for?!? You would have to reflect long wave "back" radiation up through the atmosphere. "Back radiation" is only one component of the omnidirectional re-radiation of solar energy by the atmosphere. It is true infra-red at least 5 microns wave length. Have a look at Atmospheric Radiation by Goody and Yung (1989) Figure 1.1 (a) on page 4. You will see that the Earth does not re-radiate solar energy at wavelengths shorter than about 4.5 microns. The modal wavelength for the Earth's blackbody radiation is around 15 microns and a good guess would be that back radiation of the atmosphere averages 15 microns.. The downward vector of omnidirectional radiation is called "back radiation" in the calculation of the radiation budget..
You can reflect short wave radiation back up in the direction it came from, and you can reflect near infra-red (0.7 microns up to about 3 microns) with aluminum foil and similar materials. But "back" radiation is probably longer IR and more difficult to reflect. If you did reflect it, it would not be focused but very spread out and most would be absorbed by water vapor and dust in the atmosphere. Possibly some reader with more physics than either of us could explain it better than me, but I think your proposal is non-physical. Solar cookers [same principle as Ivanpah] that concentrate solar radiation have been proven by experiment to "concentrate backradiation" when pointed at the clear sky. However, this has the effect of cooling the focal point rather than warming. Why? 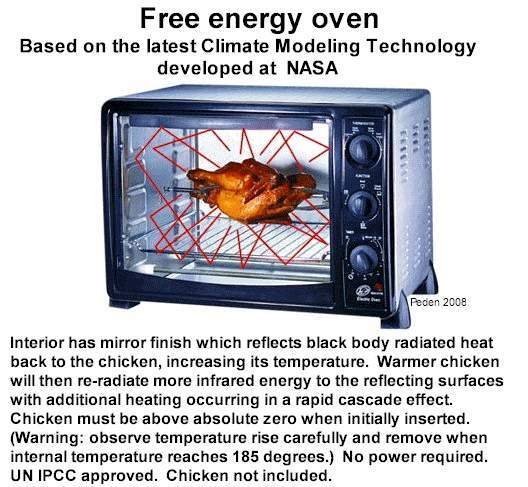 Because the mirrors enhance radiative losses to the colder atmosphere, not because "backradiation" from a colder body can be used to warm a warmer body. Further this new "reverse solar cell" in development proves that LOSS of IR from Earth to the colder atmosphere can be used to generate power. The only energy source, the Sun, only provides 168 w/m^2 and the Back-radiation 324 w/m^2 exceeds this value, so energy was created violating the Law of Conservation of Energy. Afraid it does not violate conservation of energy. A watt is not a unit of energy, but of energy per unit time, joules/sec, to be precise. Joules must be conserved, not watts. Yes it does violate conservation of energy. A Watt is indeed the rate of energy transfer in Joules/second. Over the same number of seconds, AGW claims the energy transfer in joules from GHGs to the Earth is double the average energy transfer in joules from the only energy source, the Sun. There is a ~33K "greenhouse effect" but it is due to atmospheric pressure/mass/gravity and entirely explained by the barometric formulas/lapse rate alone. The barometric formulas explain why the Earth surface temperature has little to do with radiative forcing, and is primarily determined by solar insolation plus thermodynamics [convection, phase change, pressure], not radiative forcing. Yes indeed, it's quite amazing that variations in the output from the Sun cannot "affect" the Earth's temperature, BUT back radiation can FORCE the Ocean's into compliance and make their average temperature some 20 degrees higher than an "basic physics" equation says they should be. If anything can show what total BS the whole "AGW" scam is, this should be it. If they can't capture and generate energy from this supposed "source" of energy, it should help to invalidate their whole theory. At long last! That's right. AGW theory violates both the first and second laws of thermodynamics. Bright idea, but unfortunately it does'nt work with existing mirrors. Why? Because these mirrors reflect a low steradian angle power source (Sun) which can easily be condensed into the 1000m² reception area. But clouds and atmosphere are a very open angle thermal source which energy cannot be focused in a small area for higher temperaure. No not true solar cookers can be used to concentrate "backradiation" even though it is diffuse and even though much of the diffuse source will not be concentrated, a significant portion will be. This has been proven by experimental data. And guess what happens: the temperature at the focal point decreases in comparison to the ambient air temperatures, which is why solar cookers can be used as refrigerators in the third world by pointing them at the clear sky day OR night. This is due to the 2nd law of thermodynamics: heat only flows one way from hot to cold. The concentrated "backradiation" from the atmosphere is the average ~-18C body and the focal point of the solar cooker is the hotter body at say +15C. Heat therefore flows from the focal point of the solar cooker to the atmosphere and the mirrors help to increase the heat transfer from the focal point to the atmosphere, thereby making the focal point cooler not warmer. The Ivanpah plant is basically just a scaled up solar cooker and pointing the mirrors at the clear sky day OR night will cool the focal point. I might add this same principle was used by the ancient Romans to make ice when the ambient air temperatures were above the freezing point: they dug a hole in the ground and put a pan of water at the bottom. The hole points at the colder "backradiating" clear sky, enhancing heat LOSS from the water to produce ice. Some claim the Romans made ice cream using this technique as well! 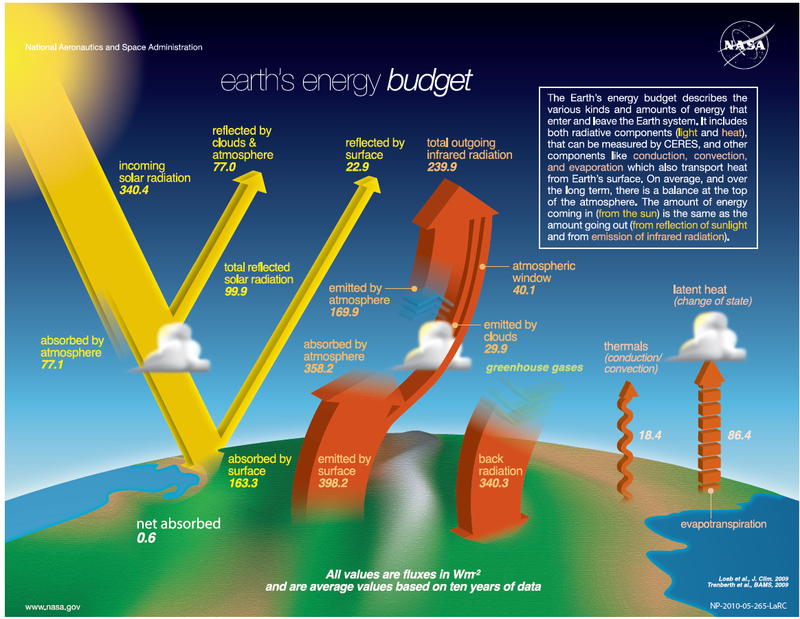 If the IPCC's "back radiation" concept were true, and it leads to more water evaporating into the atmosphere, which in turn results in more heat in the atmosphere etc etc etc etc, then why does the IPCC not explain why this absurd positive water vapour feedback mechanism idea is not evident in the real world observational data on atmospheric water vapour or the global average temperature trend?